We place temporary, temporary-to-hire and direct-hire employees at some of the top companies in the Chicago area. 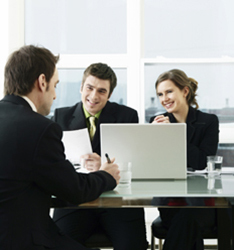 Our commitment to you is reinforced by a quality process that ensures a successful placement. This process includes behavioral interviews, customized evaluation, comprehensive reference checks and first-day, second-day and weekly checks. We are so confident you will be 100% satisfied with our placements, that if for any reason you are not, we will not invoice you for unsatisfactory work performed.